Making TIES@Western: There’s Still Lots of Time to Submit! 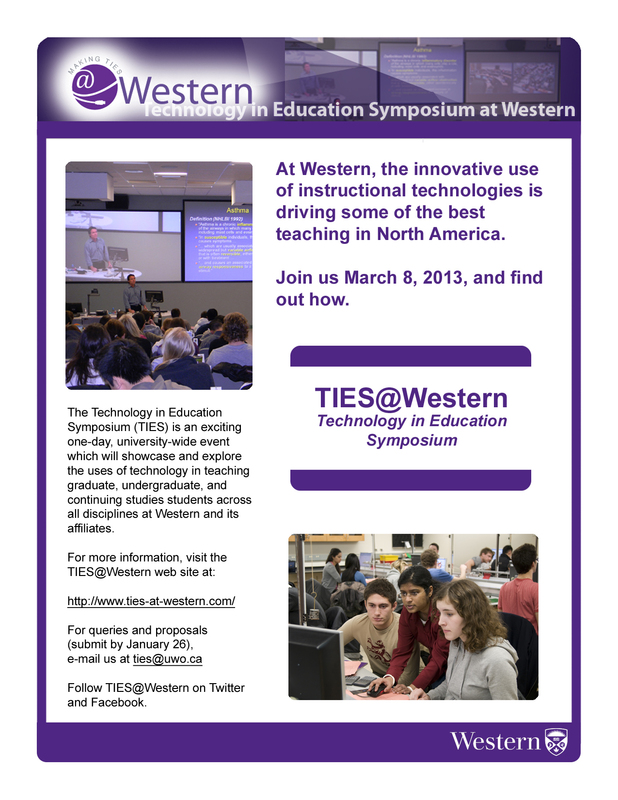 The window for submissions to “Making TIES@Western,” the symposium for Technology in Education at Western University, closes on 25 January, but there’s still lots of time to send in a proposal for a session, paper, or poster presentation! The Technology in Education Symposium (TIES) is an exciting one-day, university-wide event scheduled for March 8, 2013, which will showcase and explore the uses of technology in teaching graduate, undergraduate, and continuing studies students across all disciplines at Western and its affiliates. This symposium will focus on quality of education as it relates to instructional technology and elearning. While the sessions offered will address the opportunities and challenges of using instructional technology, the focus is less upon tools than upon innovative teaching principles and practices. Participants will hear and see how instructors and others employ technology to engage students and enrich learning, and to connect with others from across the campus who are exploring the potential of instructional technology and online education. We are seeking proposals for panels, roundtables, papers, and posters on a wide range of possible subjects. Panels should be designed for 3 or 4 papers. Paper presentations should be 15-20 minutes each. Deadline for proposals: January 25, 2013 (vetting completed by February 1). If you have further questions please email ties.proposals@uwo.ca. Josh Honn (Northwestern University) Comes to Western!